After a long weekend, the bond market is back in action. The sell-off continues, slight as it is this morning. The FNMA benchmark bond is currently down 9 basis points to 101.5. Since February 2nd, it is down 194 basis points which translates into about .5% in rate. There have been 2 days since the 2nd that the bond has increased in price. The economic news, for the most part, has been mixed but has been strong enough, in conjunction with other things like stabilizing oil prices and good earnings numbers which have led to record numbers for the stock market that have been the catalyst for this recent sell-off. On tap for tomorrow: At some point in time with this kind of a sell-off and the RSI showing oversold, you would think that investors will look at the price and think it's a buying opportunity. Tomorrow may provide some more direction with a number of economic data points being released: building permits, PPI, industrial production and capacity utilization. Tomorrow afternoon is also the release of the FOMC minutes - traders will look at this closely to try to get a read on what the Fed thinks about the economy and when they might start raising rates. Might this current sell-off only be a blip in the longer term trend of decreasing rates or is this the beginning of the end for LOW rates? Personally, I don't think we are quite there yet - though I'll be anxiously awaiting the Fed minutes tomorrow as well for more intel. I think traders will start buying again, sooner rather than later but I'm not fully confident that they will push rates lower than we saw them a few weeks ago. There's too many variables to try to guess that. Rates are great and with the various news items coming out tomorrow, it may be a good idea to lock ahead of those items, just to be safe. Make it a great day and a better week and feel free to contact me if I can help with anything mortgage-related - 702-812-1214. 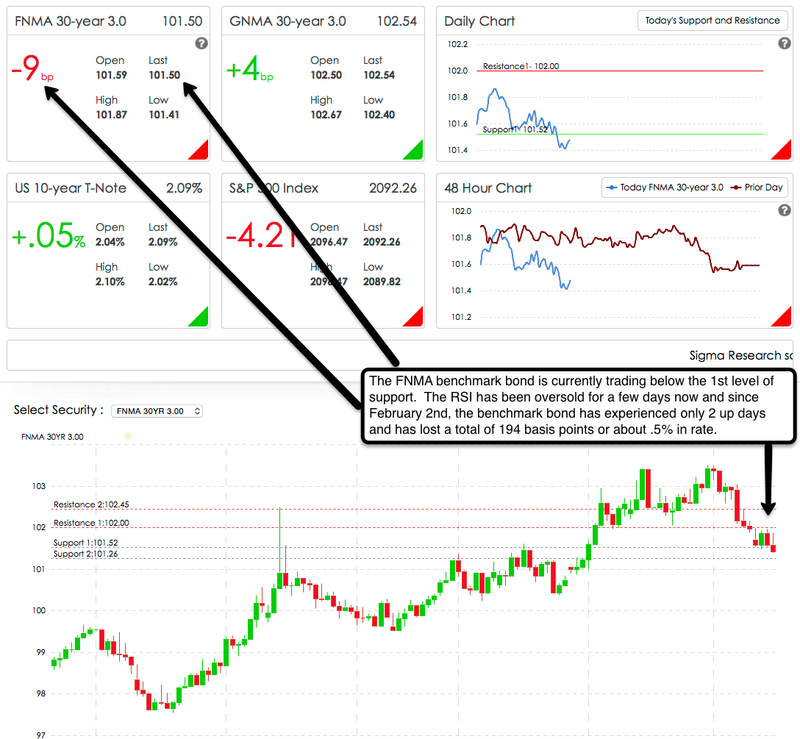 Mortgage Bond Market Analysis - What's Going On?